Each step of the 28,000 foot course (or optional one mile walk) represents an American child living with a brain tumor diagnosis. Won’t you help fund critical research and family support for local children? The highlight of the evening is a lantern-lighting ceremony to symbolize hope for a cure and to honor our stars, children with brain tumors. Course Description: 8.5k loop. Mostly flat, hard packed gravel/grass rail trail with a short on-road connector. Leads through a beautiful deciduous forest high above Mahoning Creek. Scenic. Occasional steep drop-offs. Can be muddy if recent rain. Mostly shaded. 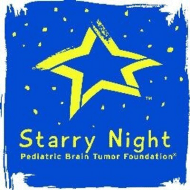 To honor our “Stars”, children with or survivors of pediatric brain tumors (and their families) will participate for FREE! They will also have a VIP tent. Lanterns (for honor ceremony at conclusion of event) will be provided for participants , volunteers and Stars/families. They are available for purchase for spectators. Food, raffles and entertainment provided! T-Shirts to the first 100 registered participants. If you participated in our car raffle last year, bring your ticket to the registration table on race day and receive a $10 rebate on your registration.